What Shall We Feed the Children? The publicity you see to the right is a full page advertisement in the May/June issue of Unity magazine, which will be mailed out this week. Here is why it is important. Imagine someone who provides refreshments in a Unity church, possibly named Gertrude, has decided to switch from offering refreshments of sugar, meat and cheese to refreshments of healthy fruit and vegetables. Then imagine after the service that Gertrude is standing next to her new offering of healthy refreshments. There is a tent card next to her refreshments that draws attention to our food supply as a common thread in these enormous global issues. Not only is Gertrude sharing her healthy snacks, but she is also passing out the recipe and she is is giving a link to her own page on UnityVeg, a place where you can learn more. Imagine the minister in her Sunday sermon on health and healing draws attention to Gertrude’s message by speaking about obesity and diabetes in children, about climate change and its impact in unprecedented wildfires and floods, and about the lack of compassion toward migrants and immigrants and the propensity for war. And the minister encourages everyone to chat with Gertrude after the service. Next imagine that the local newspaper catches wind of this and decides to do a profile story about the Unity church that has declared “We won’t feed your kids donuts.” The profile highlights that healthy eating and vegetarianism is nothing new to this church’s tradition. Long ago the founders declared a healthy body is not a problem, nor an illusion, but rather that bodily health and wholeness is an expression of Spirit and soul inspired by God. Then imagine that a young couple with young children reads the newspaper story and it turns out that they have been looking for a wholesome church for they and their children. They have tried several places, and most seem welcoming and loving, especially toward their children. But this story catches their interest because it is the only church that seems to offer support for a healthy body as much as support for a healthy soul. They decide to visit this church with their children. There seems to be an increase in Sunday visitors at the church and a surprising number of them are young families with children. The church board concludes that most of these new visitors are concerned about what the minister has been talking about: obesity and diabetes, wildfires in the west and floods in the east and the fall of compassion in our society. In consultation with the membership, the church leadership decides to declare itself a “Veg Church” and launches a promotion campaign. Full page ads are taken out in the local paper, much like the one that they have seen in Unity magazine. Other Unity churches become aware of this and their refreshment providers begin to collaborate in sharing recipes and ideas. 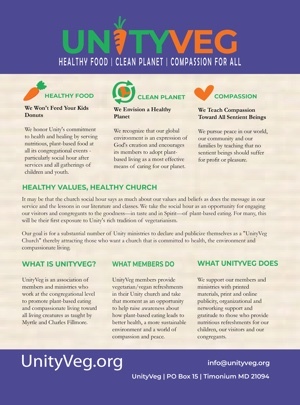 All across the country the perception begins to take root that “Unity churches are leading the way toward healthy food, a clean planet and compassion for all” by offering healthy refreshments and helping their members to take better care of their bodies. That is why UnityVeg is important. In fact, it may be that the church social hour says as much about our values and beliefs as does the message in our service and the lessons in our literature and classes. 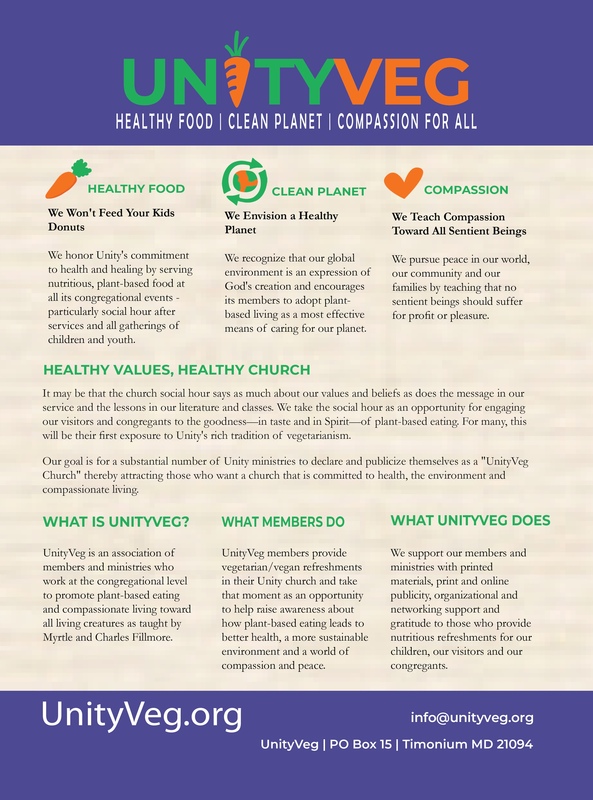 UnityVeg is an opportunity for members and ministries to work at the congregational level to promote healthy, whole and compassionate living through plant-based eating as taught by Myrtle and Charles Fillmore. It is an opportunity to support our members and ministries with printed materials, print and online publicity, organizational and networking support and gratitude to those who provide nutritious refreshments for our children, our visitors and our congregants. And it is an opportunity to take the social hour as an opportunity for engaging our visitors and congregants to the goodness—in taste and in Spirit—of plant-based eating. For many, this will be their first exposure to Unity’s rich tradition of vegetarianism.